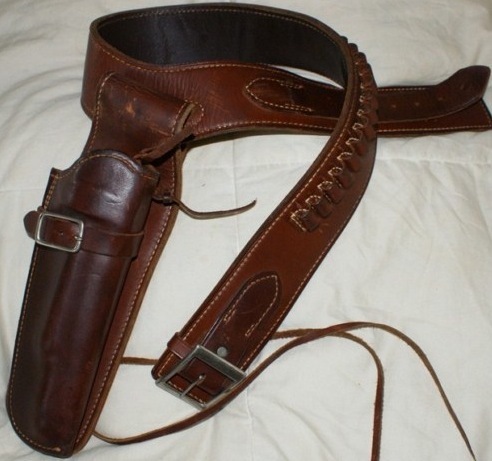 Take a look at this Vintage George Lawrence Gunslinger Holster and Belt. This George Lawrence Company Gun Slinger II holster and belt set is model # 79 and the holster is model #557. This holster fits a Ruger Blackhawk .357 magnum 6 1/2″ barrel, and may also fit other similar size models. The belt is a size medium, 38″ waist, and has 25 cartridge loops that fit .357 magnums . Both are in great condition for their age, and show normal wear, and scuffs from carrying a firearm. This holster and belt set is available on eBay for $249. Take a look at some more vintage holsters.